You've heard the saying "busy as a bee," but why not "busy as a wasp?" She is searching a sunflower plant for spiders or insects (depending on what species of wasp she is). She systematically looks over the plant, and then flies to another. Up and down, searching, searching, twitching sideways, and flicking her wings as she goes. She isn't looking for food for herself, but for her offspring. Somewhere nearby she has a small nest made out of mud where she will hide some prey when she finds it. Then she'll lay her egg on the living food and seal up the mud chamber. The egg will hatch and the resulting larva will eat the food its mother left for it. When the larva reaches full size it spins a silk cocoon within the mud nest before forming a pupa. Eventually it will become an adult wasp and chew its way outside. 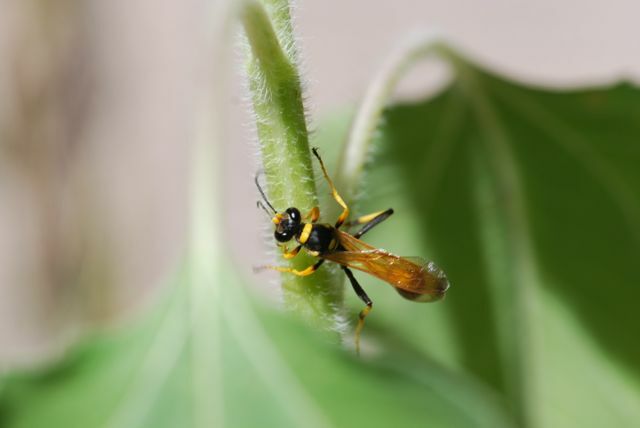 Mud dauber wasps are solitary wasps, which means that each female wasp makes her own nest and provisions it herself. 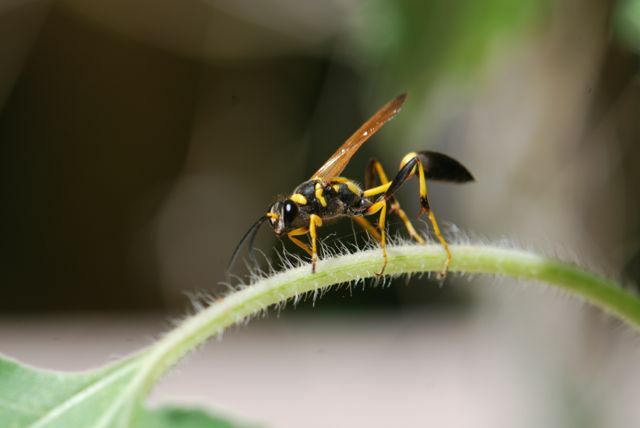 Mud daubers do not work together like some of the social wasps do, for example the yellow jackets or white-faced hornets. Being solitary, like solitary bees, means these wasps are not very defensive. Have you ever spotted a busy wasp like this one?